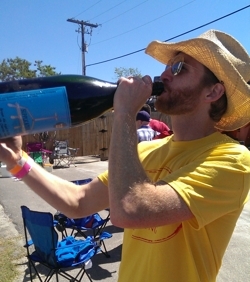 Over the years, I’ve been to a lot of beer festivals. Many of them boast, “200+ beers from 85 breweries!” Those are the ones I now avoid. That’s not very easy to do at the big drunkfest. I’ve kept track a few times, and the most beers I’ve been able to sample at a festival is in the upper 20s. I’d rather have 30 new beers at my fingertips than 200 that I’ve already tasted. The upcoming Creative Loafing Spring Hops festival on April 19 in Ybor Square is right up my alley. It features 11 local breweries, each pouring two beers. 22 beers is definitely enough in a five-hour period, and it promises to provide a more intimate atmosphere than I’d get at the bigger fests. There’s also an added bonus, pinup girls. You heard me. The festival runs from 1 to 5 pm. Tickets are $25 each and include 12 tickets (each ticket is a 3 oz. pour). There is food for purchase and you can buy more sample tickets. There are also VIP level tickets available for $50, which gets you in an hour early and includes 20 tickets. VIPs also have access to a Creative Loafing lounge with food and entertainment. For current info, visit the event Facebook page. And if you go, hit up the Twitters at #CLSpringHops and say hi if you see me. What are the primary flavor characteristics that define a Belgian wit? We’ve all been there. It’s a slow-pitch softball question. I’ve drank a hundred of these. The answer is in my brain and the neurons just can’t hit the target. I stared at the paper for at least 5 minutes before throwing in the towel and turning in my exam. It came to me about 30 minutes too late. Orange peel and coriander! I have spent the last 10 years tasting, brewing and writing about beer. So over that time, exactly how much have I learned about beer? There’s one way to find out. The Cicerone Certification Program is the beer equivalent of a sommelier for wine. It’s one way to validate that you know what you’re talking about when it comes to beer. I enjoy a challenge and competition, so I’ve long thought about going for the Cicerone Certification. Not so much for external validation, though that couldn’t hurt, but more to prove to myself that I could do it. It’s a rigorous process and costs about $400 by the end, so it’s not just something you knock out on a weekend in between batches of homebrew. On a whim last March, I decided to take the first step to becoming Certified Cicerone. The first level of certification is the Certified Beer Server. To attain that, you must pass a 60-question multiple choice online exam, which I didn’t find too difficult. I was able to knock that out with the knowledge I had readily in my head at the time. The next step to achieve level two is a much more intensive, and expensive, effort. It involves an in-person three-hour written exam and an hour-long tasting component. Last December, there was an exam being administered in Tampa and I had a couple months to study, so I decided to take advantage of the opportunity and go for it. They provide you with an in depth syllabus to guide your study. There are also courses, recommended reading, beer style flash cards and off-flavor kits you can buy. Fortunately, I had already read several of the books they recommended and had 7 years of brewing experience under my belt, so I felt good in those areas. The parts that I had to focus on were draft systems, keeping and serving beer, and beer styles. Having never worked in a bar, I found the Draught Beer Quality Manual to be extremely helpful and educational. I even learned a lot that I was able to apply to my home kegerator. I probably spent 50% of my studying effort on memorizing beer style information. Even though I feel like I had a solid background knowing and understanding most of the beer styles that have been defined, there is a lot of detail to know. From the style’s characteristics and history, to IBU, original gravity and final gravity ranges. The exam itself is a test of mental stamina. 10 years removed from grad school, it was a challenge to sit and concentrate for three hours. By the time you reach the tasting exam, it’s a welcome reprieve to be able to drink some beer. It’s just too bad that half of the samples are spiked with contaminants. The tasting exam consists of three flights. The first has a control, for me it was Sam Adams Light. You then have four other samples, three are spiked and one is not. You have to identify what the spiked samples are contaminated with and which is not. The second flight consists of four samples, and you have to identify the style between two choices. For example, distinguish the difference between an English and an American IPA. or a German Hefeweizen from a Belgian Wit. I thought this flight was pretty easy since the styles given were distinct. The third flight was the most challenging. Of the four samples presented, you had to determine if the sample was fit for service, and if not, what was wrong with it. You were told what the beer was and whether it came from a bottle or draft. I called one that was fit for service that was not and said another was not when there was nothing wrong with it. Apparently, I don’t like Goose Island 312 Urban Wheat. I thought it was spiked. While I was preparing for the exam, I did not invest in a tasting kit, figuring I could rely on several years of judging competitions and drinking beer. Apparently, I was mistaken. Surprisingly, on my first try, I passed the written portion but failed the tasting. Because of the small number of samples compared to the questions on the written exam, there’s less room for error in the tasting portion. I missed a passing score on the tasting portion by one question. So in a test of my resolve and determination, I had to drive to Orlando on February 8 to retake the tasting exam. At the risk of offending anyone from Orlando, I really don’t like Orlando. It was a tough pill to swallow. I took my lessons from the first exam and passed the second try with room to spare. The nice thing about the tasting portion is that you review the results immediately after the exam to make sure there were no anomalies with the samples, so I was pretty certain I passed when I left. 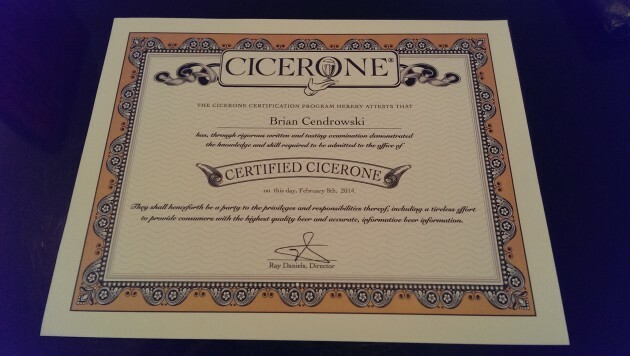 Now that I’m a Certified Cicerone, what does it mean? I’m not really sure what will come of it, but I know it will only be positive. If nothing else, I know that I know a lot about beer. And sometimes, confidence is all you need. It’s the day you’ve all been waiting for. After eight years of giving my beer away for free, you’re finally going to have the opportunity to pay money for it! On February 27, my first commercially available beer will debut at The Brewer’s Tasting Room (BTR) in St. Petersburg. 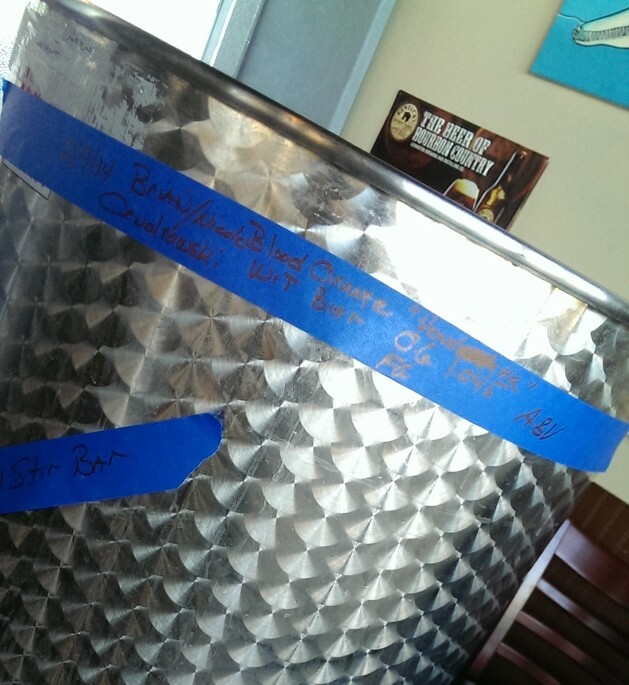 This past Sunday I brewed the Vendetta Blood Orange Wit. It’s a Belgian wit with blood orange zest and juice, coriander and chamomile added after fermentation. Vendetta pays homage to my Sicilian roots with blood oranges and chamomile, which are commonly grown on the island and throughout the Mediterranean. Brew day went exceptionally well. BTR has a 1-bbl brewing system that features three steam-heated kettles, pumps, an electronic control board, the whole deal. It’s an easy-to-understand miniature version of the systems that the big boys use and is great for pilot batches and learning how to brew away from home. I’m honored to be one of the first handful of brewers in BTR’s new program that will allow homebrewers and pros from other breweries to brew pilot batches on its system, then have the beer for sale on the tap wall at the tasting room. While guest brewers won’t receive any revenue from the sale of the beer, it’s a great opportunity to learn on a small commercial system and get free exposure in the market. 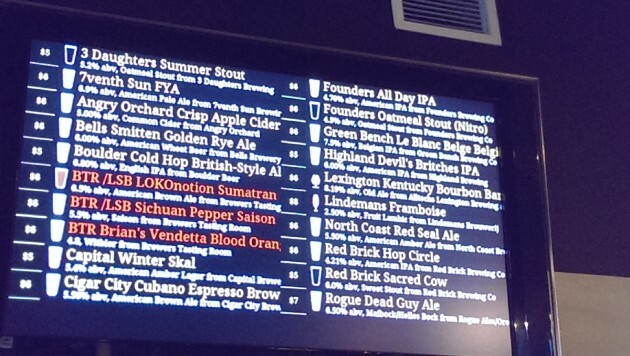 It’s the only way to get truly honest feedback about your beer: Will people pay money for it? I would like to invite you to the release party on the 27th. And bring a friend or 12! Stay tuned for more details, and in the mean time, save the date! On Saturday, September 28, one of my beers will be on tap at Septembeerfest at Southern Brewing and Winemaking. There will be 20 homebrews on tap representing five area homebrew clubs. Fest-goers will vote for their favorite and award the People’s Choice winner. Proceeds from the event will benefit the Epilepsy Services Foundation. Food and beer are included in the price of admission. It’s also a family-friendly event, and there will be kids games to occupy them while their parents get snockered.